For guys like Monrovia High School football coach Ryan Maddox and Rio Hondo Prep’s Ken Drain, the CIF-Southern Section luncheon held the Monday before the championship games have seemingly become an annual tradition. Even La Serna was back at the luncheon for a second consecutive season on Monday when all the teams in all the championship games kicked off the biggest week of the season by dining together at The Grand in Long Beach. Rio Hondo Prep was represented by Drain and team captains Colby Rivera, Jake Holguin, Rico Perez and Jared White. 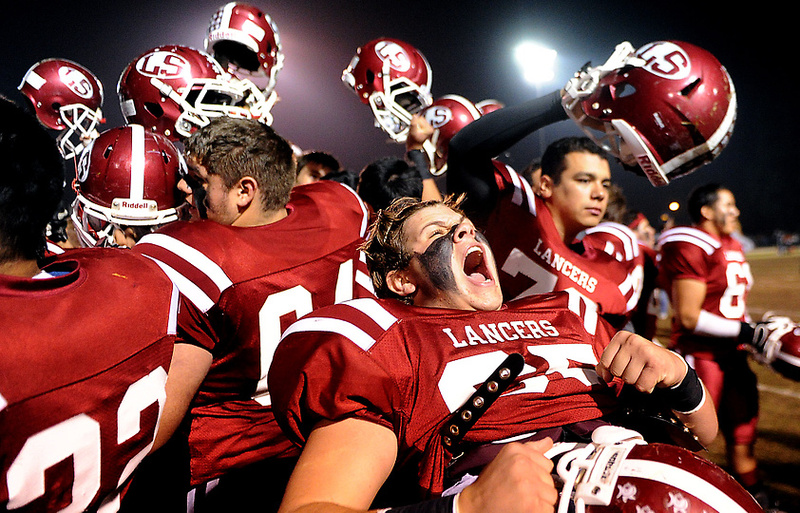 The Kares (11-1) host Mission Prep of San Luis Obispo on Friday night in the Northeast Division championship. Kickoff is 7:30. The game marks the second time this season the teams will have played. Mission Prep beat Rio Hondo Prep, 47-14, on Aug. 31 and is favored to deny the Kares their second straight division title and Drain’s fifth overall. La Serna is taking a more businesslike approach this season after last year’s championship game resulted in a disastrous loss to West Covina. The Lancers (12-1) take on Downey (10-3) on Saturday night in the Southeast Division final at either Cerritos College or Cal State Fullerton. The Lancers were represented at Monday’s luncheon by captains Frankie Palmer, John McFarland, Isaiah Osorio and Michael Dingillo. “It’s a great honor to be around the great teams, especially the captains that worked so hard to get their teams there,” Palmer said. After having been through the distractions of last season’s trip to the finals, Palmer feels the Lancers are much better equipped to focus fully on the game. Monrovia is in its fourth consecutive Mid-Valley Division championship game and bidding for its third straight title. It’s getting so that Maddox and his team should have a permanent table at the luncheon. The Wildcats were represented Monday by linebackers Brett Walsh and George Frazier V, and wide receiver/defensive back Anthony Craft. Monrovia (12-1) hosts Paraclete (12-1) on Friday night. The game pits the division’s top two teams and will provide the final verdict on whether the Southern Section’s plan to beef up the division in order to make things harder on Monrovia worked. If Monrovia wins on Friday, it stands a good chance to be selected to a state championship bowl-game qualifier that would take place next week. With so much on the line in terms of history and the chance to have its season continue, you’d think the Wildcats may be caught up in the moment. But Maddox said that isn’t the case. How does a team get chosen to play a bowl game? First u must win a section division title…then by a committee… Cal Hi Sports is predicting the Mid-Valley winner will go bowling. Don’t forget who ever wins the Mid Valley they still have to play in the regional game first and then win that to go to the state bowl game against the North. Mid Valley winner will most likely play the winner from the San Diego section then the winner of that will play the winner from D3 Nor Cal. Correct me if I am wrong Steve.